Bella Gracie is a helper! I came in from a freeeezing cold run to the store last night to a verrry hungry Bella. I said to everyone that I needed help unloading the Walmart bags and then we could eat. Brian got up to help, and I don't recall much help from the other children, but Bella astonished us. My petite 19 month old dragged each Walmart bag - probably about ten of them - through the living room to the kitchen one at a time. She also helped unload them. My favorite was turning around to see her standing on a step stool manhandling the loaf of bread up onto the counter above her head. What a good helper! This was Anna's joyful deduction as she watched Brian and Bella dance around the living room to his new favorite song. He lasted a few rounds on this cold day in December, and that is certainly reason to rejoice! Ethan: "Mom, doesn't Santa only deliver to children?" Anna: "No! He delivers to believers. People who don't believe get coal. I don't get coal; I'm a believer...(quickly turns into the Monkees melody)." There are so many nice things to do. The Nutcracker, Christmas living history events and activities, school performances of Christmas plays, parties.... But inevitably most come with a small price tag. A $5 or $10 very good price tag. But times 3 or 4 kids and a few different activities and the price tag about equals the cost of their Christmas gifts. So this year I'm being very choosy about where I spend those $5 or $10, and I'm going to focus on all of the free activities, some that we've done before and maybe some that we haven't. Make an Advent Jesse Tree. Use Ann's free devotional. Make a paper tree - I used a big sheet of brown packing paper, use a little Christmas tree, use a branch from the burn pile. Your kids will love it, I promise. A Christmas nature walk. We're planning to do this with our nature club (if anyone else is willing to part with some time this month to join us.) We'll be looking for holly, mistletoe, fir trees and other things that remind us of the season. And I'm hoping that we might find a nice location where we might even be able to collect and bring some of our finds home. Christmas parades. Sure the big city ones are nice, but there's something about a small town atmosphere - and the ability to actually see the parade, that's left us happier with the smaller ones around. A living nativity. I think that most areas have these if you look for them. Our area actually has drive through nativities as well as two walk-through-Bethlehem events. One of them is new this year and much closer than the other one. We thought we were going to miss the one we've been going to because the children have choir performances both nights, so I'm glad to have found another one. They are all free church-sponsored events and one of the highlights of Christmas for my kids. Surprise Pajama Christmas Lights. Instead of just driving past neighborhood light displays, put your kids to bed a little early, if possible, then, after everyone's in bed, but before they have a chance to fall asleep, yell, "Christmas lights! Christmas lights!" and pile into the van for a tour of the best neighborhoods. Travel mugs of hot chocolate are a nice touch. Christmas Carolling. This is becoming a lost art. I think people are just too busy to organize it. If you can grab some friends, do, but we usually just go as a family. One year we just stopped at a small neighborhood we were driving past on the way home from practice and sang at about ten houses, another year we chose a few friends to serenade as part of our pajama Christmas light run, and another year we shared a short Christmas program version of Bible verses and carols with our closest neighbors around us on every side. Christmas Books. We have a couple of boxes of these in the attic that we swap out with regular books. We like to read longer books together as well as storybooks. This year, Brian's reading The Lion, The Witch, and the Wardrobe at bedtime. I know Father Christmas makes an appearance, but I'm still not sure it qualifies as a Christmas book, but it's making them happy. 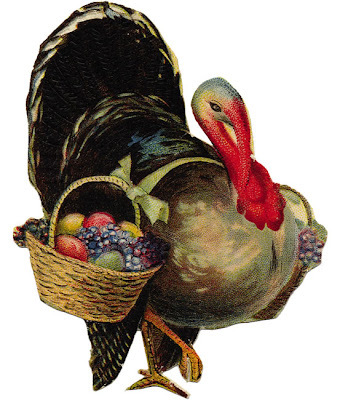 But we've enjoyed The Bird's Christmas Carol, A Christmas Carol, and many other longer holiday stories. Don't forget Christmas books on tape or CD from the library. We'll be listening to The Best Christmas Pageant Ever on our Christmas trip this year - can you believe I've never read that?! Christmas Movies. We have a bit of a movie collection, so we have lots to choose from. I like to watch as many as possible during the season. Sing a long videos are a great way to learn Christmas songs and carols. Don't have a collection? Your library probably does. If you don't have tv or cable. Hulu has a bunch of movies online. The Hallmark channel posts free holiday movies at Christmastime too. And YouTube? You never know what you'll find there, but making Christmas playlists of music videos is really fun. That should get you started, but don't forget simple Christmas crafts, baking, church Christmas programs and candlelight Christmas Eve services. Simple activities with nativities. I'll share some more ideas sometime. Click on the Christmas label for other Christmas ideas, 'kay? I know it sounds kind of weird, but, oh, yum. 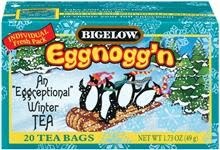 Eggnogg'n Tea is a blend of black and green tea with all those delicious sweet spices that give eggnog that fabulous smell. The only complaint I have is that it's not caffeine free. I prefer caffeine free teas because, well, I like it better when the kids I send to bed actually fall asleep. Call me crazy. Our favorite teas right now are some very relaxing caffeine free chamomile blends by Celestial Seasonings - Sweet Apple Chamomile and Honey Vanilla Chamomile tea. And this from a girl that's never been a big fan of chamomile tea, but everyone loves these, and I really do think that the kids go to bed relaxed and fall asleep faster. Next up? Ginger Snappish. I'll let you know. I asked Ethan to write about his Thanksgiving in his journal today. Sometimes I worry that he'll never know how to write in complete sentences, but for now, I'm not cramping his muse. the past ones, the others. stuffing with gravy on top. He went on to write similar pieces on other holidays. I think he may have a future with Hallmark. Today, Anna helped me mix the aromatics for the turkey, then I offered to hold the turkey up while she stuffed the cavity. She began, then, "EWW! I touched the turkey! Eww! I touched the turkey! That is so gross. I'm dropping this stuff in one at a time...I don't care.. so that I don't have to - Eww! I touched the turkey!" Rose murmurs in the background, "Why are you whining about something you're going to eat?!" Are you ready for advent? Some new printable Jesse Tree ornaments look like a promising project, though. "Me and Ethan are going to be investigators today and investigators stick together." - Anna Kate on the monocot and dicot hunt they embarked on with nature journals in hand. Maybe you've never wondered what it's like to have a husband with fibromyalgia. Maybe you need to know anyway. Maybe everyone ought to be more aware that the people around them that look normal and act normal could be living in so much pain every day that they just want to give up. How would you like to wake up knowing that you would hurt all over, have a headache, and have to think through a fog and that most people weren't going to know, care, or cut you any slack for it. On a day by day basis, it means that we can't plan anything. Oh, we can try, but we will probably have to cancel a couple of times. The children got free tickets to a waterpark that's about a mile from our home at the beginning of June, we finally went at the end of August. It was the first weekend that summer that Brian felt well enough to go. We'll go on vacation and he might have to stay in bed while we do the things we planned. We never know if it will be a good or bad week, we can only guess. We usually have a "date night" each week when our kids sleep over at their Gran's, but we can go months without actually doing anything on our date. Usually the energy required to go through the Hardees drive through is already pushing it. Our date nights are frequently just quieter, more peaceful versions of normal nights, hanging out watching a movie at home. I like them, I do. But I have to remember to have no expectations, because usually, he'll be too sick and in too much pain to want to do anything, especially after having to work all day as if he wasn't sick or in too much pain. There really isn't any choice about that. It means that home repairs are left undone, doctor bills pile up, and remedy after remedy is tried and fails. It means that the people who ought to know better, forget, or stop caring. Sometimes people just assume that you don't want to do anything. It's never the wanting that was the problem. Other people, especially people at work or at church, must assume that if you are there, you're probably doing okay. Bad assumption. If he was only at work on the days he was not in pain, didn't have a headache, and wasn't thinking through a fog, he would never be there at all. Just assume that he does have a headache, he is working through a pain haze, and he feels awful - and that if you'd woke up feeling that way this morning, you'd be home in bed. Then you'll be closer to the truth. So people, if he's home sick, you can imagine how bad he must feel, and when he comes back, he's not better, he can just stand up now. And he doesn't just miss days at work, he misses far more days at the beach, church, family outings, and parties. He spends most weekends completely drained from a week at work and goes back not feeling any better. And having fibromyalgia means worrying that someday all of that effort won't be enough and there won't be a job, and then choosing not to worry about that, because what good does that do anyway? It's in God's hands. Sometimes I don't know what God's thinking (usually! ), but if His will brings Him glory than what else is there? Having fibromyalgia means months and months of misery. Cold days are bad. Rainy days are bad. Hot days are bad. How do you encourage someone who always feels bad? It's not easy. But Brian stays in the Word, and the Lord encourages him. I'm constantly amazed that he can keep on going. I just try to push him enough to be able to live a little more fully. And sometimes I just have to do things on my own. And I'm learning to be okay with that. It's not how it used to be. It's not how either of us want it. It just is. I just think people ought to know. You don't really understand until you're there. And I remember knowing about people that had fibromyalgia and not really knowing how to help, or how to fit that help into my busy schedule. But at least remember them. Remember to pray for them. And remember that unless you heard that they were miraculously cured, they're probably still sick. And if you did truly want to help, if everyone did one thing each year for the people they knew with chronic illnesses, imagine how much easier their lives would be. Time after time, I've seen people rush to help those sick from chemotherapy - and they should! But the church gets tired of helping these people who never get well, but never die. It disturbed me before I lived the reality for myself. There are people who have helped us - with medical expenses, yard work, home repairs, and meals (when I get sick, it really goes downhill). And we are so grateful for each and every act of help and kindness. Our neighbors that we are still just getting to know on a more personal basis have really been more help to us than anyone else. They see the way he walks to the house after work, when he thinks no one is watching. They see the yard work start to go undone - and do it. They notice the car parked in the drive on a week day. They are a blessing to us, and we try to bless them in return. Jesus is my Righteousness. The End. One by one by family members are joining the ranks of the anti-dispensational "heretics." Rejecting an eleborate story of the multiple stages of end-times drama, and instead embracing a story of redemption, beautiful in its simplicity. I will not be judged by my works, but by Christ's great work on my behalf. The final judgment for works is simple - they are all good or all evil. Because I am judged on the basis of Christ's righteousness,not my own, I am declared righteous. His righteousness has been imputed to me. I don't need starry crowns or mansions either. My great reward is Christ and Him alone. If that's not enough for you, that might be something worth worrying about. Turns out making up your own Psalm melody word for word in the version you want to memorize in works even better. We've got the first half covered already. For three weeks now. Flu-like virus, upper respiratory virus/infections, stomach virus - it's mean a never-ending cycle here. And we're missing the best fall weather in the process! I've only had a couple days of a cold and Brian's felt awful the past two weeks with Ethan and Bella not faring much better, but on average 4 out of the 6 of us have been sick every day for the past 3 weeks despite as much good natural food and supplements as I can manage. Sooo...Soup for dinner - again. Brian and Ethan haven't been able to stomach much else this week, and Bella's living on smoothies. Anna and I are rebelling against the sick masses and having sandwiches and salad. Oh, and Rose is having PBJ, because that's what Rose always has if given a choice, but I'm using croutons as a bribe to get her to eat salad too - mwah, ha, ha, ha! There used to be a website for this song with a different video, but I can't find it anymore. I was glad to find the song on youtube. I set Psalm 67 to music the year we memorized it and Ethan is the best at long-term retention, so he remembers it. I was pleasantly surprised at how well they all remembered Psalm 113 and Psalm 1 from last year. As we read through it today, Ethan said, "oh, the Sons of Korah, I like their Psalms! - remember I read through all the Psalms?" I love that boy! So will you join us in the memory challenge? Choose a Psalm, there's a length appropriate for any one's learning curve, and join us! Let me know in the comments which Psalm you'll be memorizing for Thanksgiving this year. That His kingdom was no earthly possession? Translating His Church to heaven from the sod. With a pure heart and good conscience, I now win. Because he first loved me, I serve my King. But for hearts and minds of men fights Jesus' band. Justified by Him, I have a living plea! There are so many great bat resources! Anna did the Bat Shape Book at Enchanted Learning, Rose had an Itsy Bitsy Bat Book, . There are lots of other great bat activites and printables at KidZone. Isn't this little brown bat cute? Visit BatCon and don't miss the Kidz Cave. We started our nature journals in regular three prong pocket portfolios. The pockets were handy, the covers got dirty, and the prongs made it difficult to move pages around. I though a flexible three ring binder becasue it was lighter, but they are very difficult to write in. So my current recommendation is a 1/2 - 1" hard cover three ring binder, this works for us because we add projects and worksheets. This post is making me batty because some of my favorite pages, especially for little journallers are downloaded on my computor, but I cannot find the original sources to share with you. Often the best pages for littles are just plain paper, or for fun simple bordered paper. Ask what they see, hear, smell, feel, and write it down for them. Encourage them to draw whatever capture their interest. And get some page protectors so that treasures found can be pressed and saved. Head to Your Nature Journal to get inspired and connect with multiple resources. My favorite of Meddybemps Nature Notebook Pages is the list page - we keep it in the back of our jounals to use as a life list to keep track of each new animal or plant that we find or see for the first time. Donna Young has nature journal sheets for full or half sized binders. Cornell's Feeder Birds Coloring Book is wonderful. It has nice drawings with a series of questions to answer about markings, size, etc. I printed several birds that I thought we were likely to see, and when we have a chance to have an extended observation of one of them, we pull the sheet out of the nature journal and fill it in. Notebooking Pages has some really nice nature journal pages. Her feather pages were a free download at one time, and I use them for feather collecting by stapling small zipper sandwich bags to them for the feather. 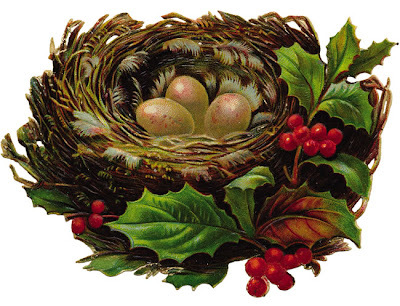 Currclick has some free products, including Journal Junction's Signs of Spring, Cedar Tree Press' Nature Journal Pages, and Notebooking Nook's bird notebooking pages. Jimmie's Collage has unthemed, pretty notebooking pages. The American Museum of Natural History's Online Field Journals are great for identifying just about anything. Exploring Nature Educational Resources are just that, topically listed. I really didn't want to go apple picking this year. I tried to bribe them with a trip to the local farm for apples and apple pie, candy apples and apple printing, but they would not be dissuaded. We finally got there this past weekend, much later in the season than usual. Brian felt worse and worse as the day wore on, so we left him on a sheet under an tree and hauled all the way to the opposite end of the orchard to pick what was left - Granny Smiths. Fortunately, no one seemed to mind eating them, even if they are considered baking apples. I'm really glad I took the wagon, but hauling the apples and Bella up and down the hills of the orchard reminded me yet again that our pioneer predecessors would have been ashamed of my lack of stamina. Some apple cider helped revive me for the wagon ride. And the pumpkin patch finally yielded the photos I'd been hoping for. And look at little miss "I don't look at cameras and smile". She grinned her head off in a whole series of photos with her daddy. Go figure.